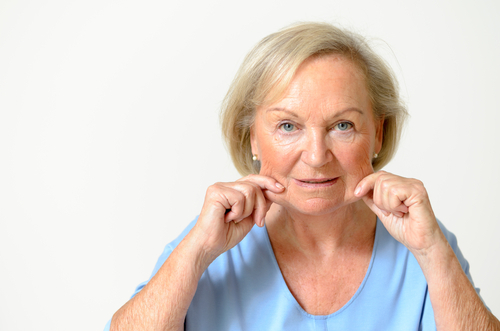 Jowls are one of the most frustrating and yet most common signs of aging. They are the bags of skin and fat that develop along the jaw that lead to an undefined jawline appearance. Unfortunately, with time and age, some formation of jowls is likely to occur in all of us. Even diligent skin care and sun protection are not always enough to prevent jowls from forming. When the frustration of jowls becomes too much to handle, and they are changing the overall shape of your face, then facelift surgery may be your answer. Jowls are caused by a loss of skin elasticity and muscle looseness as we age, and they develop due to a variety of reasons: age, genetics, gravity, or environmental factors. While your body produces a lot of collagen and elastin when you’re young, it produces less and less as you age. And with less collagen comes less skin tightness. Other factors that speed up this loss of collagen and elastin include sun exposure, poor skin care, smoking, excessive alcohol consumption, and dehydration. When collagen and elastin break down, and normal aging changes occur, especially around the cheeks, the face loses its firmness and tightness, and the underlying muscles and cheeks cannot be kept in their desired location. Combine this skin laxity with gravity, and you may find that your skin and the underlying tissues start to droop toward your jawline until there is nowhere else for them to go. In addition to the breakdown of collagen and elastin, jowls can also result in individuals who have experienced significant weight loss or individuals who have looser skin. Facelift surgery is the most common and longest-lasting treatment available for the reduction of unwanted jowls. Due to the nature of jowls, the only way to get rid of them is to lift the tissues and skin that have dropped from the midface. This is sometimes combined with lipocontouring and other advanced techniques. Facelift surgery increases the tension on the lower and midface by not only tightening and trimming the loose skin but also repositioning and tightening the underlying muscles and soft tissues. During this procedure, any tissue that has fallen to the jawline is lifted and repositioned to reveal a smoother, more youthful and defined angular jaw and uplifted cheek. After facelift surgery, jowls can officially become a thing of the past. To learn more about how facelift surgery can get rid of your jowls, contact Dr. Alexander by calling (702) 242-6776 or filling out our online form to set up a consultation.